An international collaboration of Researchers, including Scientists from Shinshu University (Japan) and the Director of Penn State’s ATOMIC Center, has created a graphene-based coating for desalination membranes that is more strong and scalable than present nanofiltration membrane technologies. 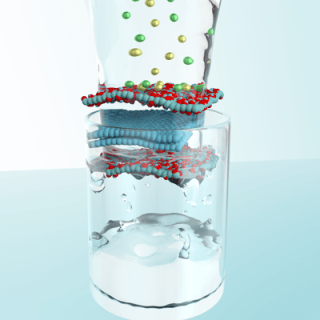 The result could be a sturdy and practical membrane for clean water solutions as well as wastewater treatment, protein separation, and food and pharmaceutical industry applications. Our dream is to create a smart membrane that combines high flow rates, high efficiency, long lifetime, self-healing and eliminates bio and inorganic fouling in order to provide clean water solutions for the many parts of the world where clean water is scarce. This work is taking us in that direction. The hybrid membrane created by the team uses a simple spray-on technology to coat a mixture of graphene oxide and few-layered graphene in solution onto a backbone support membrane of polysulfone altered with polyvinyl alcohol. The support membrane boosted the robustness of the hybrid membrane, which was then able to endure the intense cross-flow, high pressure and chlorine exposure. Even in initial stages of development, the membrane rejects 96% of dye molecules, and 85% of salt, sufficient for agricultural purposes though not for drinking. Extremely polluting dyes from textile manufacturing is regularly discharged into rivers in certain places around the world. Chlorine is commonly used to lessen bio-fouling in membranes, but chlorine quickly degrades the performance of existing polymer membranes. The incorporation of few-layer graphene makes the new membrane very resistant to chlorine. Graphene is said to possess high mechanical strength, and porous graphene is estimated to have 100% salt rejection, making it a potentially suitable material for desalination membranes. However, there are numerous challenges with scaling up graphene to industrial range including managing defects and the need for complex transfer methods required to control the two-dimensional material. The present research tries to overcome the scalability issues and offer an economical, high quality membrane at manufacturing scale. The study was conducted in the Global Aqua Innovation Center and the Institute of Carbon Science and Technology at Shinshu University, Nagano, Japan, where Terrones is also a Distinguished Invited Professor. The team includes Researchers Aaron Morelos-Gomez, Josue Ortiz-Medina and Rodolfo Cruz-Silva, former Ph.D. Students of Terrones. Morelos-Gomez is Lead Author on a paper published online on August 28th in Nature Nanotechnology describing their work titled “Effective NaCL and dye rejection of hybrid graphene oxide/graphene layered membranes.” The Japanese Researchers, Hiroyuki Muramatsu, Takumi Araki, Tomoyuki Fukuyo, Syogo Tejima, Kenji Takeuchi and Takuya Hayashi, were also led by Professor Morinobu Endo. Our membrane overcomes the water solubility of graphene oxide by using polyvinyl alcohol as an adhesive making it resistant against strong water flow and high pressures. By mixing graphene oxide with graphene we could also improve significantly its chemical resistance. This research was supported by the Center of Innovation Program, Global Aqua Innovation Center for Improving Living Standards and Water Sustainability, from the Japan Science and Technology Agency.